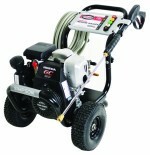 When it comes to pressure washers they can be divided up into two main types – electric powered and gas engine powered. Electric models are cheaper and considered light duty suitable for residential jobs. Gas models have more cleaning power and may be designed for residential or industrial applications. They are much more expensive and require fuel to operate, but are also more portable and great on job sites. They can also be divided up into categories ranging from light duty to extra heavy duty based on how much pressure they output in terms of PSI (pounds per square inch). (See chart at the bottom of this page for the proper application for different cleaning jobs). In addition to PSI, the other important spec to look for is GPM which is the gallons of water per minute a sprayer uses. You can then calculate the total cleaning power by multiplying PSI by the GPM. While prices range from about $100 up to well over $1000, for this article we focused on models designed for residential use that cost less than $500. We selected the top 5 best electric and gas pressure washers. See our reviews on each and their specs below. 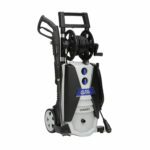 The Sun Joe SPX3001 has pretty much everything you could want which is why we chose it as the best pressure washer that is electric powered. We especially like the onboard reel that makes it easy to reel up and store the hose conveniently. It comes with a 35 foot power cord and 5 quick connect nozzles. At just 32 pounds it is also easy to move around. Buyers should remember that electric powered models do not have as much cleaning power as gas powered units, which is why we recommend the Sun Joe SPX3001 for light and medium duty use, but not for heavy duty use. A very close second on our list is the AR Blue Clean AR390SS. It is just a tick behind the SPX3001 in terms of cleaning power, but can still tackle moderate jobs around your home. It comes with a 30 foot hose, 35 foot power cord, and 4 quick connect nozzles. It is also super easy to attach a hose to it, unlike some models. Overall the AR Blue Clean AR390SS makes a good choice for homeowners. 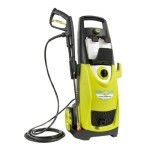 The best selling pressure washer on Amazon is the Sun Joe SPX3000. One unique feature that you cannot always find on other models is the two onboard detergent tanks which lets you switch between detergents to easily blast away dirt, grease, and grime. It also comes with 5 different nozzles, a 20 foot high pressure hose and a 35 foot power cord. 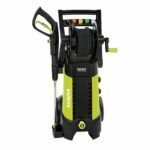 The Sun Joe SPX3000 is also the cheapest pressure washer on out list, so if price a concern then we highly recommend this model. The Karcher K5 Premium has a lot of nice features including a water cooled induction motor designed to last 5x longer, a hose reel, and two different wands – a dirtblaster wand and a vario spray wand which lets you adjust the pressure right on the wand. Portability is easy thanks to 7.7-inch wheels and top handle. 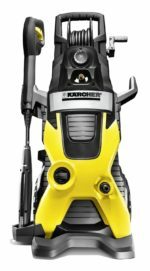 The Karcher K1800 has a bit less cleaning power than the higher rated pressure washers. However, it does have a few unique features as well including a 3 year limited warranty. The handle folds up when in storage so it takes up less room and it has a foot on/off switch so you don’t have to bend over. The K1800 also has a large bin for storage of the 20 foot hose and the wand. Three nozzles are included. 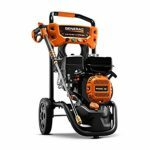 We chose the Generac 7019 OneWash as the best gas powered pressure washer. The advangate it has over its peers is in the PowerDial gun that which lets you change between 4 different application settings – car, wood, conrete, and soap. This gives you more control so you use the correct pressure on each job. It also has 10″ never flat wheels and a 1/2 gallon detergent tank. The Generac 7019 OneWash is a great choice for all jobs ranging from light duty to heavy duty, but it will not handle industrial extra heavy duty jobs very well. One good selling point of the Simpson MSH3125-S Megashot is its reliable Honda engine that you know will not let you down. This thing is also well built and rugged with 10-inch tires. Other features include 5 quick connect nozzles tips, 25 foot high pressure kink resistant hose, and onboard accessory storage. The Simpson MSH3125-S Megashot is durable enough to handle light professional work and jobs that do not need a super high pressure. 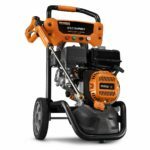 The Generac Speedwash 6882 is Generac’s newest pressure washer and has the longest kink-free hose on our list at 30 feet. It also comes with 2 unique attachments – a turbo nozzle and soap blaster – designed to get your job done faster. The turbo nozzle has a rotating pinpoint that removes dirt and grime 30% faster than standard nozzles, while the soap blaster sprays soap up to 3x farther to penetrate tough stains. Overall we think the Generac Speedwash 6882 is a great choice for residential uses. The Generac 6923 is essentially the same unit as the 7019 just without the powerdial spray gun. Instead it has a spray gun designed for comfort with a cushioned grip and easy to pull trigger. It works great on moderate jobs around the home. 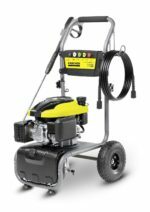 If you need a cheap gas pressure washer then you should consider the Karcher G2700. It is a bit weaker than other gas-powered units, but still more cleaning power than electric models and thus works well on medium duty jobs. The G2700 comes with 8-inch pneumatic tires, 5 quick-connect nozzles, and a detergent tank. 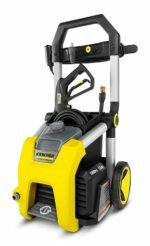 The Karcher G2700 is the best gas pressure washer under $250, so if price is your biggest concern then this one is for you.